I always had a romantic fondness for yaks, dating from my child’s anthology of literature which included the poem below by Hilaire Belloc, illustrated with a pen and ink drawing of a friendly yak carrying a little girl who looked (I thought) just like me. A yak would be just the thing for taking me to school, which was a long walk (through snow, dragging my lunch pail and so forth). Here’s the poem and doesn’t it make you want a yak? Inspired by these immortal lines I asked my father for a yak. I knew for sure that he wasn’t “awfully rich” or even close, but I thought it worth a shot. No, he would not buy me a yak. Imagine. Winters can be cold in New Jersey, but he was immovable, actually didn’t even seriously entertain a conversation about yak-pet pros and cons. My mother, however, did say that if I opted against a fancy wedding, they’d give me a yak for a wedding present. Sounded reasonable to a 7 year old. Some years later when I was 20, I did get married, did have a very inexpensive wedding in my parents’ living room and did NOT get a yak. Or rather not a real one. On top of the wedding cake (German Chocolate, my favorite) was a paper mache’ yak made by an artist friend. What a blow. As it happened, the marriage was a huge mistake, ended not soon enough, and the yak was lost in the shuffle. 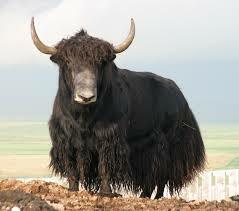 But I still like yaks, or rather the idea of them. However now I live in Tennessee which is probably too hot for them. What animal did you always want?